The ideal off-grid home would have wood, laminate, linoleum, tile, concrete, or some other hard flooring throughout the house. If only we’d known where our path would lead us when we moved into this home 7 years ago, we would have opted for hardwood floors throughout the house instead of having wall-to-wall carpet in the bedrooms. Of course, we had no idea we’d eventually be going off the grid. Boy, if only we could go back in time, we’d do quite a lot differently. When the time comes to replace the bedroom flooring, we’ll likely do laminate throughout the house. If you’re worried about hard floors being cold or not insulating the home as well as carpet, large area rugs are a great option. What’s wrong with having wall-to-wall carpet in an off-grid home? Unfortunately, vacuums use a lot of power to run. Our solar panels may produce enough of a surplus of energy throughout the sunny Summer months to run a vacuum, but I’m sure there will be other more important uses for that energy. Sure, we could buy more solar panels so that we could run appliances such as a vacuum, but honestly we don’t feel it’s worth the investment. Especially since there are other options. Since we’ll likely have carpeting in our home for several more years, I needed to find a non-electric method of cleaning the bedroom floors. I found an inexpensive, yet highly recommended non-electric floor sweeper which I have found to be satisfactory for vacuuming up crumbs, hair, and pieces of trash from the floor. My kids love using it to clean their rooms, which is great! Since it really only sweeps up surface debris and doesn’t have any sucking power, it doesn’t do a good deep down cleaning. I imagine we’ll probably run the generator once or twice a month as needed, so that I can use the electric vacuum for a more thorough cleaning. We all take our shoes off at the door before entering the home. This really helps to reduce the dirt tracked in. We don’t allow the children to eat outside of the kitchen or dining area. (This can be tricky with a 3 year old who likes to snag food and run off with it to play.) This keeps crumbs from being scattered throughout the house. We don’t allow the pets in the rooms with carpet. This reduces the need for vacuuming pet hair from the bedrooms. 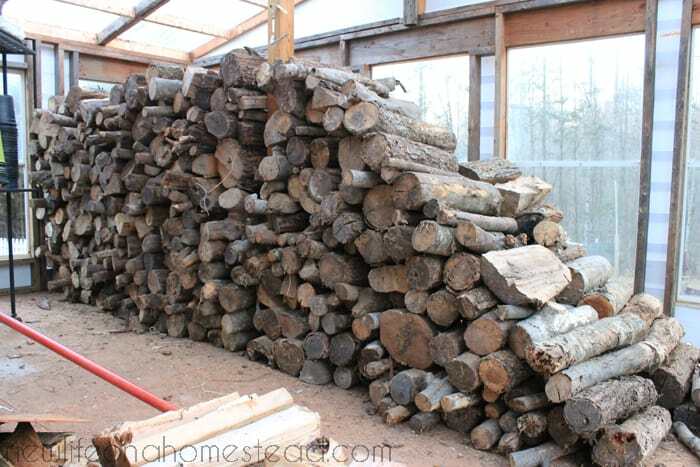 An American Homestead has a great article on this subject, which you might also enjoy reading. What are your thoughts on carpetless homes and vacuuming off the grid? I finally got solar power attached to the power grid. It cost me 27 thousand for 8k. It lowers my bill 150 dollars. I was thinking about ripping out my old carpet and putting in wooden floors but I’m 60 and have hip arthritis. Carpets help with this. As much as I hate carpet it’s easier on the joints. I guess when you are older there are more things to consider. I was actually looking up some recipes on using up some oatmeal from this morning when I happened across the off grid section. My husband and I have been completely off the grid for … I guess it would be 2 October’s ago now. I don’t know what kind or how large of a system any of y’all have of course but I love my “perfect sweep turbo” by Bissell. I just plug it in for a couple of hours and I can get A few days worth of cleaning out of it. Otherwise we have an old 12 amp dirt devil we use about once a month for deep cleaning. But that Bissell really surprises me on how well it picks stuff up. Hi, we are getting ready to buy a homestead property in Montana and I would LOVE any insight you have, for what you would have done different! 1. I would have a basement. 2. I would have planted perennial fruits and nuts immediately. 5. If we’d had a choice, it would have been better to build a smaller, more efficient home for off grid living. Those are probably the major things I wish we could go back and do differently. Good luck with your new place! I love carpet sweepers and I can’t wait until we have floors with no carpet, especially this almost white one that came with this remodeled house! My hubby-and-I-built home has had only polyuretaned plywood floors for 40 years. I sweep and mop. No energy use. And the kids stayed healthy. Kendra-can’t wait to hear how your garden is going this year! hope the planning is going well. I’m starting over in a new home-so lots of work to do here. so I scoured your website again to get things in order. Can’t wait to replace our hardwood either, but until then this is great info! Thank you! And that once a year steam cleaning makes an incredible difference until then. Takes a lot of energy (energy from me and electric power), but we breathe much easier and makes it easier to clean the carpet throughout the year. not as much built up gunk. I need to get seeds started, Becca!! The rest of my seeds should be here this week. I hope it’ll be a good year! Hi! I’m your reader living in Finland. In my country nearly nobody uses shoes inside homes. It’s almost considered rude if someone does that visiting somebody. Actually even in my childrens school, they take their shoes off. We are so used to be just with our socks. At work in my office I use shoes, but I change outdoor shoes to indoor shoes every time I go there. We don’t have much carpet floors here either. I’m very interested about off-grid living! That’s very interesting, Aila! Thank you for sharing what people do in Finland. I’m always curious what other cultures do. I think Americans could learn a lot! We have a shoe shelf by our entrance where the kids place their shoes. It’s super helpful 🙂 We’re still working on reminding our 3 year old to take his shoes off when he comes in, but the rest are always good about it. We used one of those sweepers when I was growing up. 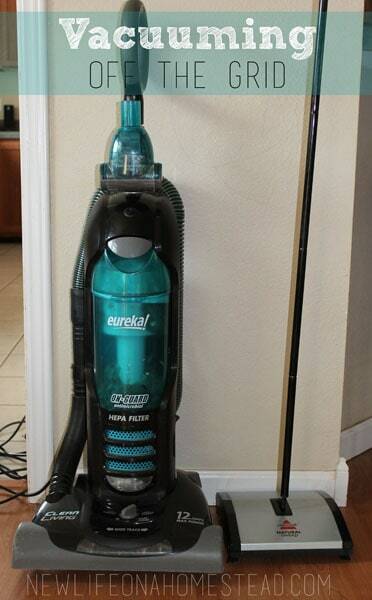 We didn’t have a real vacuum until I was in high school. I’m not that old either. 😉 The house I live in now had wall to wall carpet and it was nasty. I ripped it all out to find, to my surprise, original hardwood floors. They are in dire need of refinishing, but that project will have to wait for a while. We really need to replace the linoleum in the kitchen and bathrooms. I think hard flooring is the only way to go. I have always hated vacuums and the noise they make. If my feet are cold or I don’t want to walk on a hard floor, I just put on my nice cushy Dearfoams slippers. They are a lot cheaper than carpet, a vacuum, electricity and carpet cleaning. Oh, NO! I didn’t realize that was showing my old blog and old email address until I hit Post, and then it was too late. 🙁 Canadian Doomer is no more. Carpeting is also very toxic since it is made completely from man made chemicals and keeps everything trapped in it. We have mostly hardwood on our bottom floor and laminate that looks like wood upstairs, including all the bedrooms. I LOVE it. We have the manufactured hardwood downstairs and it is the best. We’ve had it for almost 18 years and have not done one thing to it and it still looks great. The laminate is the same. It is just not as pretty or as comfortable to walk on as the real wood is.